FOR IMMEDIATE RELEASE: Portland, Maine (October 30, 2017) – New England Fights (NEF) makes its long-awaited debut in Portland this Friday night, November 3, 2017 with the fight promotion’s next mixed-martial-arts event, “NEF 31: The Old Port.” Earlier today, NEF announced that the event weigh-ins will originate from the lounge of the Fireside Inn & Suites this Thursday, November 2, 2017 at 2 p.m. EDT. The Fireside Inn & Suites is located at 81 Riverside Street, Portland, Maine 04103. Weigh-ins are free and open to the public. Fans and press are encouraged to attend. All of the competitors on this Friday’s card will be present. Fighters will be available for interviews and photo opportunities. 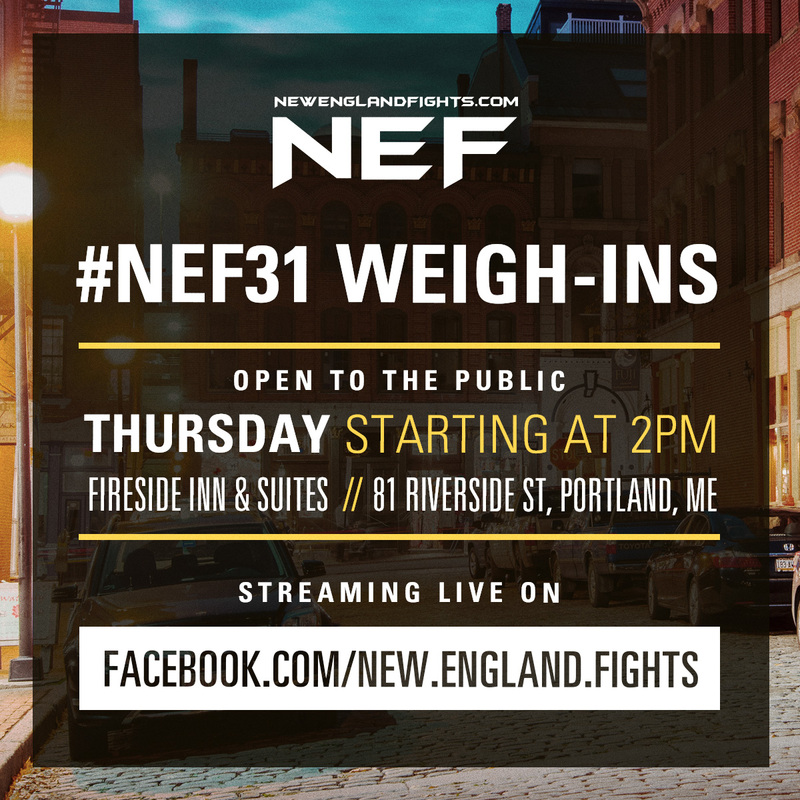 For those unable to attend, the weigh-ins will stream live on the “New England Fights” Facebook page. NEF’s next mixed-martial-arts event, “NEF 31: The Old Port,” will see the company debut in Portland, Maine at the brand new, state-of-the-art venue Aura. The event is scheduled to take place this Friday, November 3, 2017. Tickets are on sale now at www.auramaine.com.